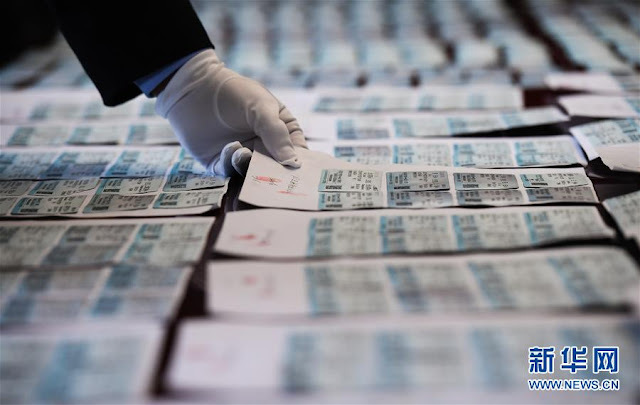 Chinese politics from the provinces: Spring Festival Is Real, But What About The Tickets? Spring Festival Is Real, But What About The Tickets? Train tickets for Spring Festival this year went on sale nationwide on Wednesday. Many tickets to and from Nanjing sold out in just a few moments, some in even less time. The good news is that the Nanjing Railway Police Department [南京铁路公安] have plenty of train tickets—nearly 3,000 by their estimate. The bad news? They’re counterfeit. 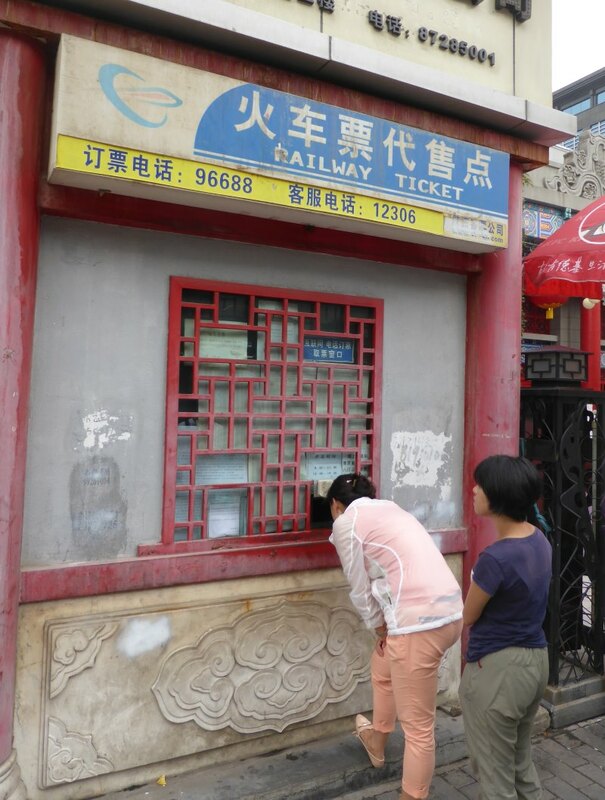 The afternoon before Spring Festival tickets became available for purchase, Nanjing officers raided a 6-person hair salon in Changzhou [常州], Jiangsu province. They seized tickets, a computer and a printer, and arrested a man by the name of Zhu [朱], the 33 year-old owner of the barbershop. Police said that Zhu had advertised his ticket services on Taobao [淘宝], China’s online commerce site, and promised that as long as an ID card number [身份证号码] was provided, train tickets could be customized according to the travel plans of buyers, and delivered to the doorway by express delivery. 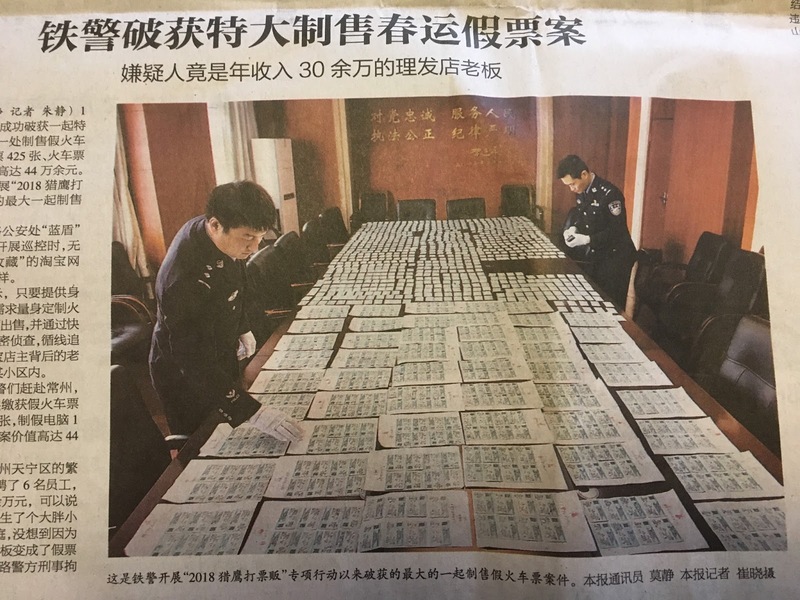 That’s almost identical to the arrangements Nanjing Railway Police saw when they raided a similar operation in Anhui province a week earlier. Zhu got nailed by “Operation Falcon” [猎鹰打票贩], a nationwide effort to crackdown on the illegal traffic in train tickets. Interestingly enough, Nanjing Railway Police don’t normally engage in that sort of swooping down on suspects: They usually cast themselves as the friendly officers at the local stations here, simply lending a helping hand or locating lost luggage. But this is good work, and they deserve great praise for their efforts. At the same time, people and police officers alike have to be wondering: When raids are netting a single person, a computer and a printer—and thousands of tickets---who else is out there, hiding behind a website and a local storefront, tapping away at a keyboard and bashing away at social trust? Spring Festival is still a few weeks away. No one need celebrate too early.